Having already achieved a Diploma in Animal Management, Steph joined the practice in 2006 as an apprentice groomer and qualified a year later. 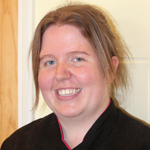 Steph is based at our Stowmarket grooming parlour where she grooms all breeds of dogs. She has a very spoilt Lhasa Apso called Barney and two cats, Marilyn and Sid. Mel joined the practice as a trainee groomer in 2005 to pursue a new career and fulfil her life-long dream of working with animals. She qualified as a dog groomer in 2007 and now works in the grooming parlours at both the Stowmarket and Moreton Hall centres. 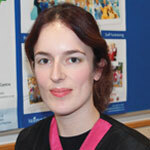 Mel has a great love of all animals and ensures her patients enjoy the whole grooming experience. She currently has two cats of her own – Mansun and Mavis. 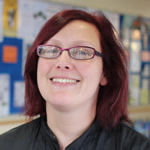 Sarah trained as a dog groomer with Central College of Animal Studies and now works at the Moreton Hall Veterinary Centre grooming parlour. 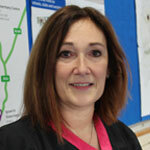 As well as caring for all her grooming clients she looks after her four children, two elderly dogs and a rabbit. 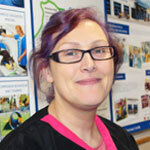 Lesley is a qualified and experienced veterinary nurse and dog groomer. As head of grooming she leads the training of dog groomers for the practice group. With regular attendance at veterinary and grooming conferences and exhibitions Lesley is able to bring the latest innovations to her team. Lesley has a menagerie of animals at home in addition to dogs and cats. With first hand experience of tortoises, parrots and other exotics her advice on these pets is often sought.